Rafael Nadal delivered the performance of a seven-time Grand Slam champion to end Andy Murray's hopes of reaching his first Wimbledon final. Murray had hoped to become the first British man since 1938 to reach the final but Nadal was stronger in the key moments as he won 6-4 7-6 (8-6) 6-4. The Spaniard made the decisive move in a superb second set tie-break. Nadal will meet Czech Tomas Berdych in Sunday's final after the 12th seed beat Novak Djokovic in straight sets. "It was a very, very good match for me," the world number one told BBC Sport. "To beat Andy you have to play your best tennis, it's always a big challenge and it was an amazing victory for me against one of the toughest opponents in the world." The Majorcan, who was unable to defend his 2008 title last year because of injury, extended his winning streak at the All England Club to 13 matches as he reached his fourth straight final. The defeat sees Murray miss out for the second year in a row on ending the 72-year wait for a successor to Bunny Austin, Britain's last male finalist, and ensures it will be at least 75 years before there is a successor to Fred Perry as a British Wimbledon men's singles champion. "I'm not feeling like I played terrible," said Murray. "I'm disappointed to have lost, I didn't play a bad match at all. I've had some good wins against Rafa where I played great tennis. "It's not like I played badly. He played great, and that was the difference." Nadal showed exactly why he is the world number one with a breathtaking display of huge forehands and turning defence into attack. David Beckham caused a ripple of excitement with his arrival among the Centre Court crowd before the start of the second semi-final but there was already electricity in the air - it felt like the heavyweight contest the tournament had been waiting for. Both men were sharp from the outset, Murray sealing his second service game with two aces and a lob volley, but he failed to capitalise on the first half-chance when presented with a second serve at 30-30 in game eight and Nadal quickly made him pay. The Spaniard fired a forehand into the corner to earn the first break point of the match at 4-4 and a nervous Murray forehand into the tramlines gave Nadal the chance to serve out the set, which he duly did after 37 minutes. Murray continued to hold the edge on serve early in the second set, making an impressive 76% of first serves as he won his first three service games to love, but he could not break Nadal's resistance from deuce at 2-2 and 3-3 as the former champion held him off brilliantly. Finally, a superb defensive lob brought Murray his first break points of the day at 4-3, 15-40, but a big first serve, a succession of heavy forehands and a vicious backhand winner got Nadal out of trouble. The match remained as tight and tense as it had been in the opening moments, with every winner feeling like a victory and each error a disaster, and the stakes were raised even further as the second set came down to a tie-break. Murray had won three of his previous seven matches against Nadal but had never come back from a set down against the Spaniard, let alone two, and it was crucial that he took the chance to level. A raking backhand return put the Scot into an early 2-0 lead but when he hooked a forehand into the net for 2-2, the better part of 15,000 spectators let out a collective groan. Nadal's resistance seemed to have finally cracked when he double-faulted at 5-5 but Murray could not find a first serve on set point, and the world number one levelled with a brilliant volley. He then brought Murray to the net and got a slice of luck with a net cord that helped his backhand pass avoid the Briton's flailing racquet, and a brilliant angled forehand gave Nadal the tightest of sets. It was a hammer blow for Murray, but Nadal gave his opponent - and the crowd - a huge lift just when hopes were fading by dropping serve to love at the start of the third set. But it was a long way back for Murray and, as his first serve dipped below 50%, the irrepressible Nadal struck back to make it 4-4. 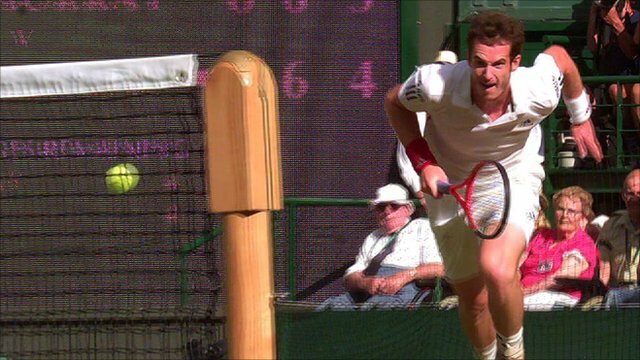 The former champion was simply unstoppable, a fizzing forehand helping him to match point in game 10, and Murray fired over the baseline to end the battle after two hours and 21 minutes.